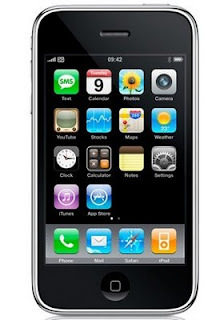 The new Apple iPhone 3G has already sold out on the O2 and Carphone warehouse sites here in the UK. However, you don't have to worry as both companies have assured that they have stock in their stores when it is launched on Friday (11 July, 2008). In case you are wondering, the only significant difference between the old and the new model is that the new iPhone has 3G capabilitie, meaning faster internet browsing speeds. It also has GPS built in. Now you don't have to depend on static Google Maps anymore. I was thinking of getting the Nokia N95 but I may have to reconsider. As for the physical characteristics, it will be slightly thinner on the edges and thicker in the middle as compared to the old model. If you are just interested in the look and not concerned about the features, you don't have to upgrade to the new phone. I predict that eBay will soon be flooded with old iPhones and you might be able to get your hands on one for a few pounds. Read the Reuter's report: "iPhone UK websites swamped before Friday launch". I got mine and I love it. You should get one they are awesome well worth the price at least here in the US it is. gonna luv it. what an awesome phone.